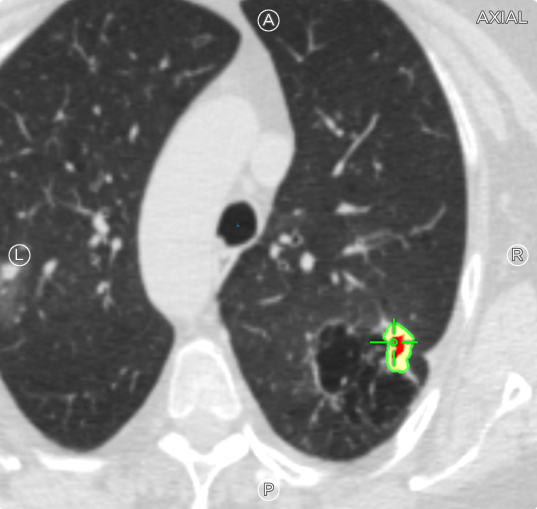 This 61-year-old female with a history of one pack per day smoking and COPD presented with a 23mm nodule in the RUL that was PET positive. 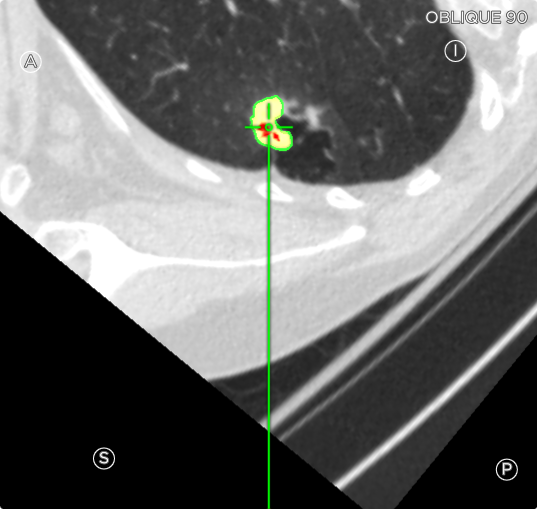 She had previously undergone a nondiagnostic CT guided biopsy that resulted in pneumothorax. The patient did not want to undergo another invasive procedure and instead found that Veran’s ENB would be a safer and less invasive option. 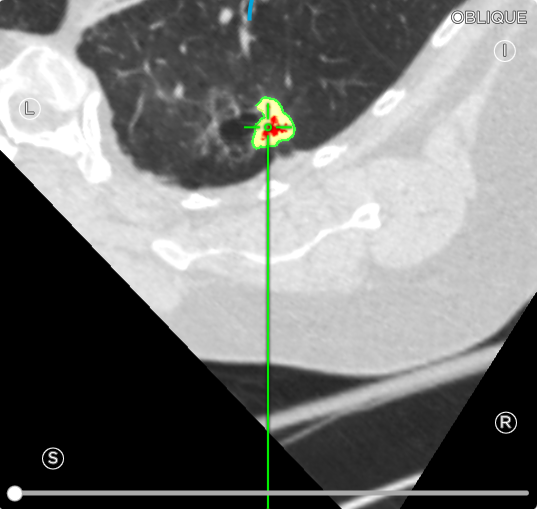 Using the SPiN Planning™ software, Dr. Alnijoumi segmented a 23mm target in the right upper lobe and selected an additional target located near the nodule on a small airway that had to be manually grown. Dr. Alnijoumi began the procedure using Linear EBUS obtaining samples from 11L and 11R that were ultimately negative. After completing all of the necessary sampling with EBUS, he transitioned to electromagnetic navigation. 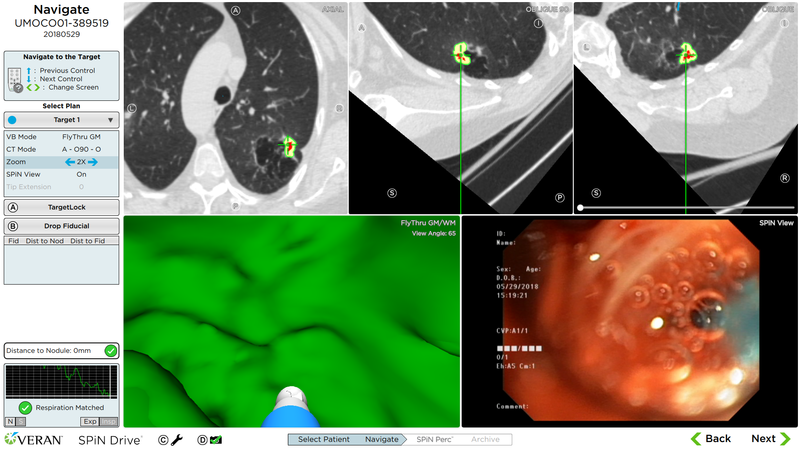 He was able to quickly navigate to the 23mm RUL target and obtain multiple samples using an Always-On Tip Tracked® SPiN Flex™ needle, Serrated Cup Forceps and Brush to obtain multiple samples. ROSE was not present for the procedure; however final pathology reported the samples to be positive for Adenocarcinoma containing lepidic growth. The patient recovered well from the procedure and was sent for a surgical consult.